Even after the S&P 500 Index dropped 20%, many investors believe it’s a bull market. Some bulls point to economic data. They argue it can’t be a bear market since that data is strong. They’re partly right. Economic data is good. But that’s the problem. The data is as good as it gets. That’s confirmed by a powerful indicator that many market professionals follow. History shows recessions begin when economic data is strong. Take the unemployment rate as an example. When unemployment is low, few people are looking for jobs. This means employers raise wages or offer better benefits to add employees. The Federal Reserve fears inflation. So, it raises interest rates to slow the pace of the economy. Eventually, the Fed raises rates enough to slow the economy. But the economy is like a large ship in the ocean. It turns slowly. It can’t turn quickly. The Fed can’t immediately restart growth. Soon after the economic data says all is well, a recession occurs. Other economic data shows the same trend. It gets better and better and eventually turns down as a recession develops. The chart below is warning of a recession. It’s also warning of a stock market top. It’s an important chart. Yet few individual investors are even aware of the indicator in that chart. This indicator is the DeMark Sequential. It’s a popular indicator among market professionals. Market professionals subscribe to services offering DeMark indicators on Bloomberg terminals and other services. That’s why few individuals are aware of them. The DeMark Sequential follows precise rules developed more than 40 years ago. Traders use it to spot tops and bottoms in stocks and futures. I won’t provide a complete explanation of the precise rules to apply the Sequential. I’m just highlighting its current warning. The Sequential begins with a setup. A setup requires consumer confidence to close higher than it was four months ago for nine consecutive months. The unemployment rate requires a series of lower closes. Once the setup completes, the countdown begins. It increases by one each month that consumer confidence is higher than it was two months ago. For unemployment, it increases each month the data is lower than it was two months ago. When the countdown reaches 13, market pros expect reversals. 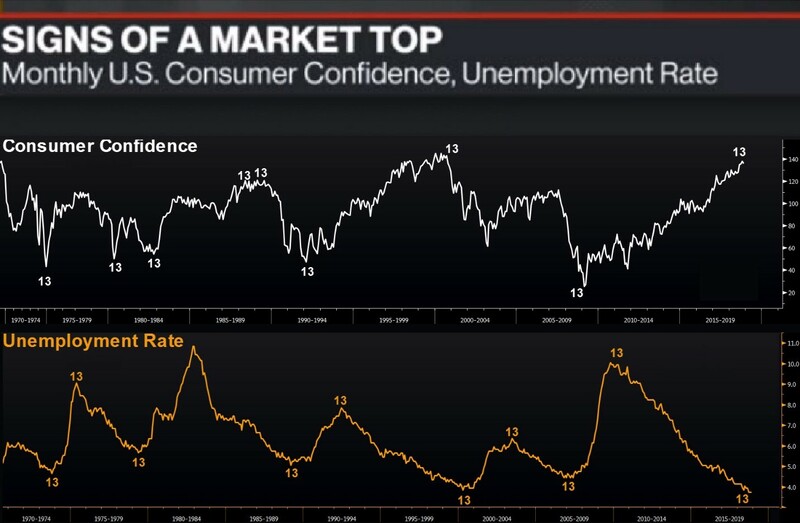 The chart shows 13s in consumer confidence and the unemployment rate. This means we should expect declines in confidence and increases in employment. Sequential recognizes that after a trend lasts several years, a reversal is probable. However, unlike most indicators, Sequential adapts to the market. It can reset and often completes a new setup before giving a signal. This makes the signals relatively rare. It’s one reason the indicator is more reliable than traditional indicators. Consumer confidence is a great stock market indicator. When it turns down, stock prices fall. That’s because investors take money out of stocks and hold more cash when they’re worried. It’s a natural reaction to concerns about a recession. The chart shows these indicators have spotted turning points in economic data at important times. Consumer confidence peaked at about the same time that stocks did in 1973, 1987, 2000 and 2007. Unemployment confirms readings in the confidence data. Sequential has a long history of success. Tom DeMark, the developer of the indicator, frequently appears on Bloomberg Television. He has noted tops and bottoms for stocks markets in the U.S., China and Hong Kong. In a recent appearance, he highlighted his concerns about the U.S. economy. That chart above is telling us to worry about the economy and the stock market right now.